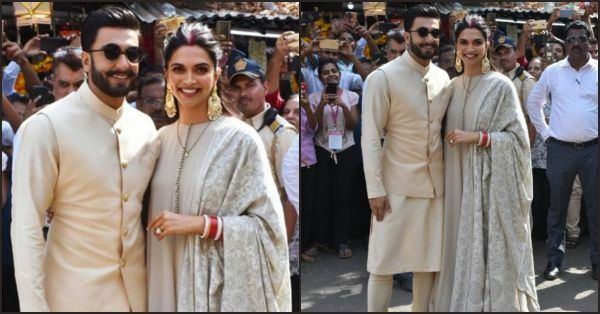 Twinning In Sabyasachi, Deepika Padukone And Ranveer Singh Visit The Siddhivinayak Temple! 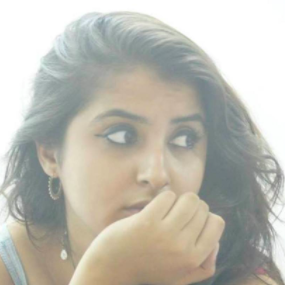 2018 will go down in the history as the year everyone in Bollywood got hitched. It all started with Sonam's phenomenal wedding, then Neha Dhupia and now Deepika and Ranveer have also tied the knot. After an intimate wedding in Lake Como, Italy the two celebrated their union in Bangalore with DP's friends and family. They even had another reception in Mumbai where they gave a whole new meaning to royalty. Now the newlyweds Deepika Padukone and Ranveer Singh are at Siddhivinayak seeking the Almighty's blessings. A huge crowd gathered around the temple to greet the country's sweethearts! Both were obviously twinning yet again in Sabyasachi and we're falling more in love with them every day. DP wore a cream coloured anarkali suit complete with her nayi naveli dulhan ensemble of choodas and sindoor. She accessorised with chandbalis and looked absolutely radiant. Ranveer wore a cream coloured kurta-pyjama with a Nehru jacket. Both their families accompanied them to the temple. Anisha Padukone walked with daddy Prakash Padukone as they led the crew for the shaadi walas. Ranveer's parents were also spotted as the entire family sought Devine blessings. In a recent report, Ranveer also spoke about the great influence our Mastani has been in his life. He said that he could have been carried away with the fame and success he received but it was his wifey who anchored him. Awww! Aren't these two just the cutest? Tomorrow is a big day for DeepVeer as they are hosting a reception for their Bollywood buddies so stay tuned for all the scoop!